One of my favourite things about living in the countryside is having the space to grow our own herbs. I must say there is something very rustic about walking out my door to grab a bunch of fresh parsley or thyme for dinner. My daughter has started following me there these days and even sticks out her nose for a sniff of whichever herb we’re cooking with! I remember a time when roasting a chicken seemed like a big deal to me. Now it has become something we cook almost once a week. The best thing about this dish is that it keeps on giving. We always use the leftovers the next day for a salad or stir fry and boil the bones to make a delicious healthy stock for soups or stews. 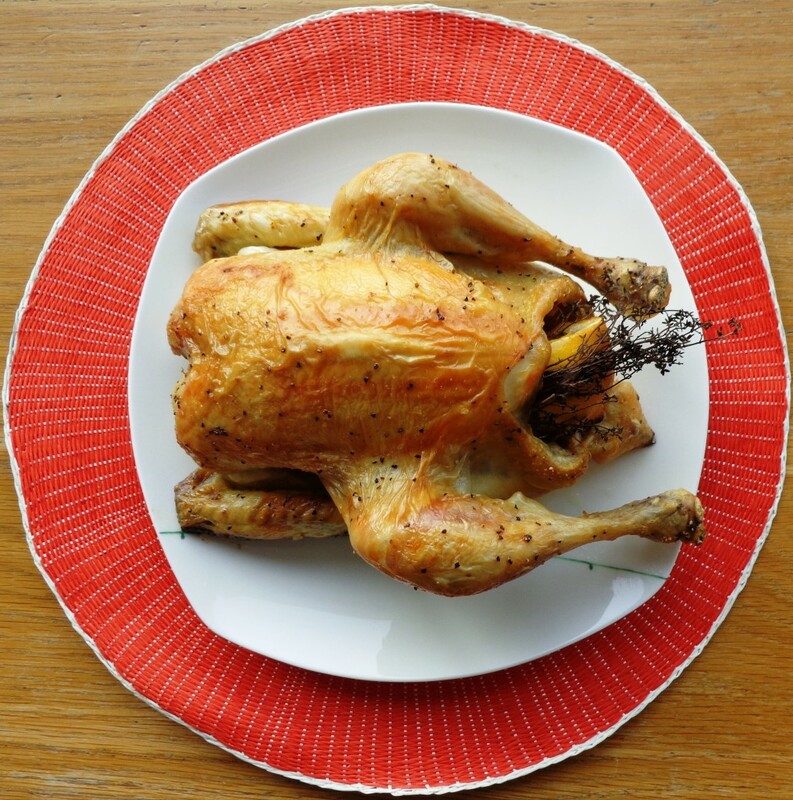 Roasting a whole chicken is so much better value than buying chicken breasts plus the roasted wings and legs taste so good! In my house we have a rule: I do the cooking because I love to cook but my husband always carves the meat. I may be many things but I am certainly not a butcher! Preheat the oven to 180 degrees Celsius, 350 Fahrenheit or gas mark 4. Grease a large baking tray with some olive oil. Remove packaging from the chicken and place into the dish. Place the two peeled garlic cloves, two lemon halves and the bunch of thyme in the chicken’s cavity. Place the onion halves in the roasting dish next to the chicken. I usually use a pastry brush to cover the chicken in olive oil but you can rub in with your fingers. Then season with a generous pinch of sea salt and black pepper. 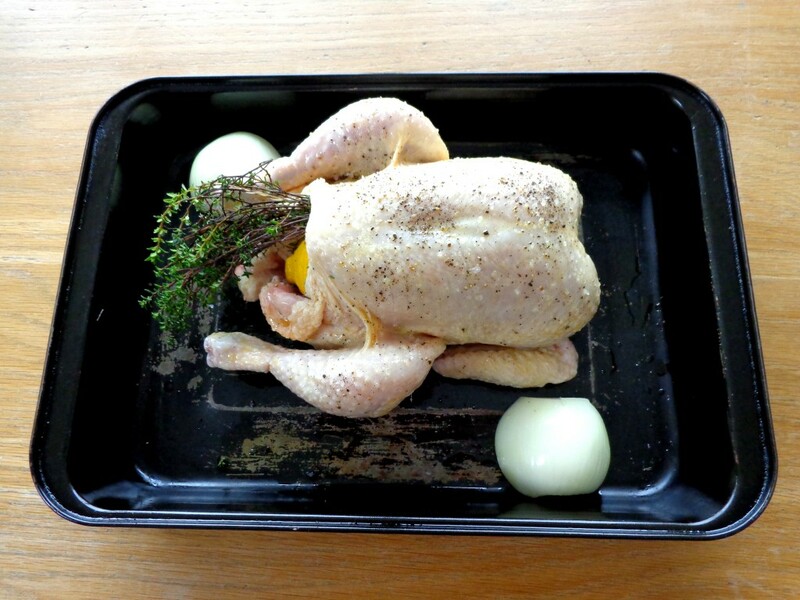 Cover the chicken and roasting dish with tin foil and place in the oven. Bake for 1 hour then remove the tin foil and baste the chicken with the pan juices. I usually remove the onion halves at this point because they will burn. You can use them in a stock or gravy later. Place the chicken back in the oven without the tin foil for 30 minutes to brown the skin but keep an eye on it so that it does not start to burn. Check that the chicken is cooked through with a food thermometer or until juices run clear. Rest the chicken for 30 mins wrapped in tin foil to enhance the flavour and to allow for easier carving. Enjoy with some SCD legal cranberry sauce and roasted vegetables.